Today, a message from Nancy Lynn Jarvis, the mastermind behind COZY FOOD. Like Tom Brokaw, my husband Craig, the guy who did computer magic so “Cozy Food” worked, has multiple myeloma, a plasma cell cancer. He was diagnosed a little more than two years ago. If he’d developed this disease a decade ago, he’d likely be dead by now, instead he’s doing well. Fortunately great strides have been made and survival times keep getting pushed out because of research, new medicines, and new treatments. Five of my books are real estate mysteries set in Santa Cruz. 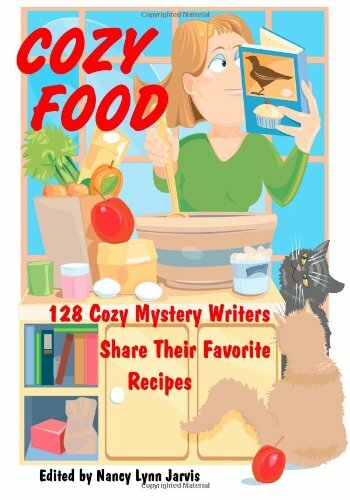 My husband and I also edited a terrific cookbook called “Cozy Food: 128 Cozy Mystery Writers Share Their Favorite Recipes” which qualifies in the mystery category because all the recipes are from mystery writers. This year’s Greater Bay Area MMRF event is a 5K Walk/Run which will be held in San Francisco on March 22nd. I’ll be there selling books and introducing “Cozy Food” to new readers. All proceeds will be donated to MMRF. For people with e-readers or those who can’t make the event, profits from e-books purchased on Amazon that day will also be donated. (My Amazon Author page is http://tinyurl.com/6uq4gsx if you want to take a look at the books or get ready to buy one on March 22nd.) “Mags and the AARP Gang,” another book I’ve written will also be included for those who prefer humor to mysteries or cookbooks. Please spread the word about the fundraiser. Email your friends. Post about it on your blog. Tweet and share thru social media. E-books are only $3 or $4 each — such a small donation to make — but if enough people buy one, not only will they get a book they may enjoy reading, but we will raise some real money…perhaps enough to keep my husband and many others around for those who love them. COZY FOOD is available from Nancy at her website, or from Amazon in print and for Kindle and all free Kindle apps. This entry was posted in Guest Posters. Tagged cancer, charity, myeloma, mysteries. Mr. Brokaw’s doing pretty well, I hear. I hope your hubby continues likewise.